During a conversation with Vagn Holmboe in 1986, when I was visiting him at his home, he told me two things. First, that he had little intention of allowing his first two Symphonies to see the light of day - this was before BIS undertook their complete recording of his 13 Symphonies, and we should be grateful that Vagn released these two works for the 1st is the earliest work of his we now know, and very interesting it is, and the 2nd, which won him a Denmark Radio prize and gave him the money to buy the land on which he built his home and where he lived for the rest of his life, proves to be a big boned, very exciting and complex piece - and second, that in 1943, during the darkest days of World War II, after Denmark refused further co-operation with Nazi Germany, and its Navy sank most of its ships, he felt that the world was teetering on the brink of total disintegration and he wrote a work into which he poured all his worries and misgivings about the world situation. However, this work, he said, which was never performed, would never see the light of day. As these things happen, once a composer is no longer with us his papers are inspected and trawled over and all manner of things come to light - look at the plethora of premières we’ve had of Benjamin Britten’s works over the years since his death - so it was only a matter of time before someone discovered the Sinfonia Disintegrazzione. It’s a huge work, certainly Vagn’s largest orchestral piece and it displays both the path he ultimately took as a composer, and the path less well trod in the 20th century. In four very large movements; the first is named Operation Weserübung - the Nazi’s code name for the assault on Norway and Denmark - and it is a long, tortured, Allegro marziale, full of disjointed march rhythms, the staccato rap of gunfire, huge climaxes and no relaxation. It is a draining experience. The slow movement - In memoriam - is a funeral march for the dead and the loss of democracy and freedom. This music is more dissonant than the first movement and it becomes progressively more dissonant and angular. The scherzo - Apocalypse Now - is pure 12 note music, and it is ugly and barbaric; there’s no trio to this scherzo just a straight through, six and a half minute, rant. It’s brief - like a short sharp shock, or, perhaps, a blitzkrieg, and it’s just as disturbing and unpleasant. The finale - Freedom - moves from dodecaphony to tonality and the hope of victory and a free and better life. The music ends triumphantly in an uneqivocal, bright, E major, the key it has been working towards from the opening in B flat. Throughout there’s an edge to this music, which is very uncomfortable, but there is a logic to its progression and the whole piece is held together by the continuous use of the rhythm of the famous V for victory motif. Following the folk inspired 3rd Symphony, Sinfonia Rustica, op.25 and the prayer for peace Symphony No.4, Sinfonia Sacra, op.29 (both 1941) this work will come as a shock to many Holmboe fans for it is a very disturbing and, dare I say it?, a rather unpleasant work. 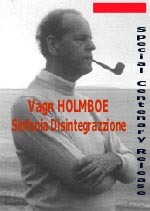 By the time Holmboe came to write his incisive 5th Symphony the following year he had worked his devils out of his system and found his own voice. This recording was made in a hurry by danone after a race to get the rights to record the piece between danone, Danacord, dacapo and several other Scandinavian labels who fought hard to receive the requisite copyright permission. There are problems with the recording, however, some brought about by the recording itself. The Copenhagen Glee Club Orchestra is a well established band which has played under the direction of the distinguished conductor Wilhelm Breuning-Svendsen, who was a student of the legendary Swedish conductor Rane Thorleifsson, for some time. It’s a noble effort but the enterprise is let down by the fact that the recording engineer, Gunnar Bunnar, was drunk during at least one session and the whole of the slow movement was lost when he forgot to press the record button on his F1 player, so a further session had to be arranged, thus involving more expense to an already expensive undertaking - one hopes that Ørsteds Parken, a lifelong friend of Holmboe and now EU Minister for Overproduction, and chair of the EU Ethics Committee, who sponsored this recording, wasn’t angry about this. Also, throughout the scherzo the entire percussion section plays its part one bar late due to a mistake in the orchestral parts made by the copyist - and as the producer couldn’t read music, and had never heard the piece before, he had no idea of the error. However, the orchestra ends the scherzo with the loudest of flourishes to be followed, a bar later, by a loud crash from the percussion; it is most effective! There are a couple of other niggling errors which are too small to mention - except the moment at the peaceful start to the coda of the finale when you can clearly hear the harp retuning the top four or five strings. The recording is very good, if slightly out of focus at times, probably Gunnar Bunnar’s fault again, and the separation of violins to left and right is clearly heard but in the first two movements the trumpets appear on the left channel and in the third and fourth movements they are on the right. The notes in the booklet, by Anton Deck, are OK but contain a couple of small Northern annoyances. Can I recommend this disk to you? The answer is yes for the chance of our hearing such an important document is too good to miss, despite the few mistakes listed above, and the few not mentioned.